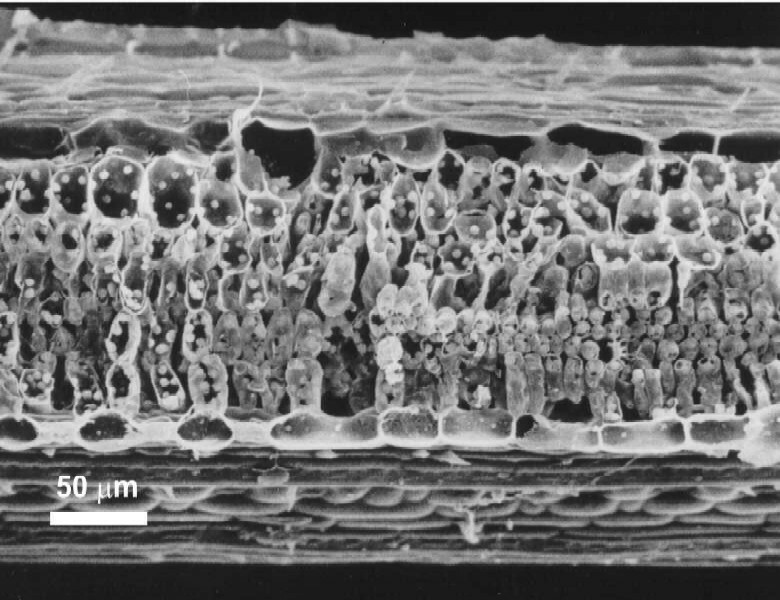 When leaf material is carefully prepared, then is it possible to see the insides of cells, as is the case in the micrograph to the left. Here, we can see what the internal structure of this grass leaf looks like and can see organelles (presumably chloroplasts) within the cells. This is a longitudinal section of the leaf, and Kranz mesophyll tissue occupies the central region. The round depressions in this cell wall, are pitfields, containing large numbers of plasmodesmata The unlabelled arrows point to a few examples of these, in the the cell wall interface between the Kranz mesophyll and bundle sheath cells in a C4 grass. The images was made using a Scanning Electron Microscope. Click here to see other examples of plasmodesmata in transverse and longitudinal view.